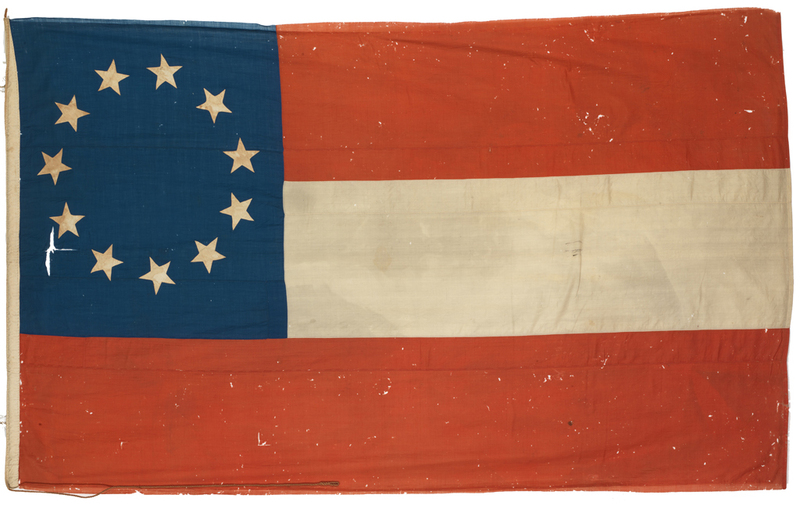 Here’s the deal: the Confederate battle flag (not to be confused with the Stars and Bars or First National flag of the Confederacy, pictured above) did not exist at the time of the First Battle of Bull Run. So, re-enactors at First Bull Run events should not expect admonishment by authorities to keep their colors cased. Authors of First Bull Run books should not expect their removal from online trade sites because of offensive if historically accurate dust jacket illustrations. Vendors of First Bull Run battlefield applications and war games should not expect suspension of the ability of customers to purchase or download their product. To the diggers in these woods, the Hollemans [well, their buttons, cufflinks, and suspender hardware, anyway] belong in Oakwood Cemetery, led there by honor guard, laid alongside men who fell at Gettysburg. Let me guess: the ceremony will be held on a Saturday (or holiday), when lots of people can come out and watch you guys, right? NY State Military Museum highlights artifacts of 1st Union officer killed in Civil War. Check it out here. Another WaPo article, this time about some sixth-graders at Stonewall Jackson Middle School in Manassas and their film project on First Bull Run. Nice photo gallery, too. Check out this WaPo article on Manassas and the sesquicentennial. Nice photo gallery. I wanted to briefly update you and let you know we launched our YouTube Channel earlier this week. Featured on the page is information about our national treasure: The Captain Thomas Espy GAR Post 153. Sadly forgotten, the ceremonial room and artifacts were preserved over the years, locked away in a Pennsylvania library. In 2010, the Andrew Carnegie Free Library & Music Hall received a donation to restore the Post to its original grandeur! This room is so unique–as it is a snapshot of the esteemed GAR organization. This Post is believed to be the most intact in the nation. Tours are free. The room is open every Saturday from 11 to 3, or by special appointment. Please visit our YouTube channel and learn more about the room! Also, we are having a sesquicentennial living history weekend. We even have a facebook page. We enjoy uploading documents, facts, and pictures, so it is well worth joining as well. Please join us, and feel free to pass this information on to friends. 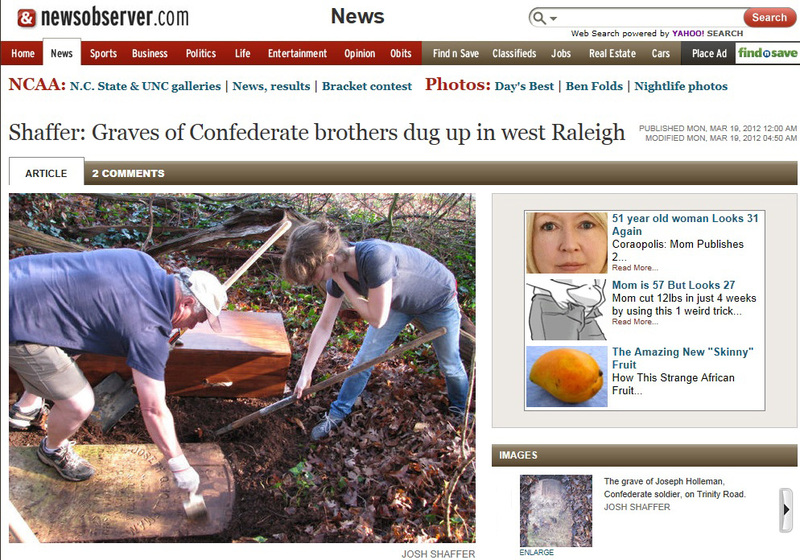 This is such a rare treasure in Civil War history, and we want everyone to know about it. Feel free to contact us with questions, interview requests, etc. Diane Klinefelter, library director and civil war historian, can be reached as 412.276.3456 ext. 5. The GAR room is a real treat (I’ve written about it before here and here). If you’re in the area, check it out! 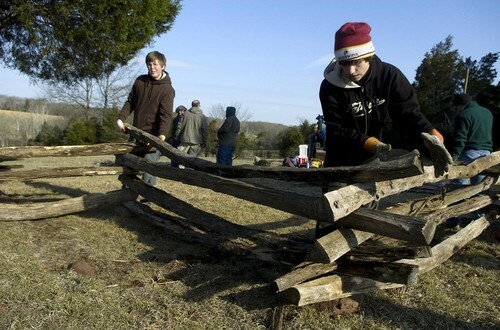 According to this article (from which the above photo was taken), some Loudoun County Boy Scouts are working at Manassas National Battlefield Park for our benefit. Thanks go out from Bull Runnings to these young men.